It's a ARM926EJ RISC SOC(System-On-Chip) made by Samsung seminconductor. This chip is 14mm x 14mm size, FBGA package with ball pitch of 0.65mm. the S3C2416 chip is a 32/16-bit RISC cost-effective, low power, high performance micro-processor solution for general applications including the GPS Navigation and Mobile Phone markets. Additionally, in order to allow for lower system costs, higher performance and low power, the S3C2416 is fabricated using the 65nm low power CMOS process. All in all, the S3C2416 presents a low-cost, highly embedded solution with upgraded features. The S3C2416 carries revolutionary upgrades with respect to the S3C2412. 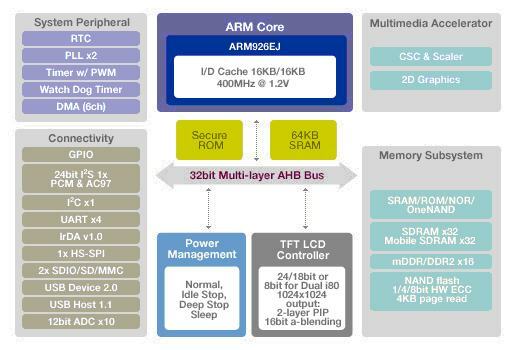 Most notably, an upgrade to the ARM926EJ core, the integration of a 2D Graphics Accelerator, an added low power mode, as well as embedded internal ROM/RAM for secure boot, moviNAND booting and low power audio decoding. Furthermore, peripheral and feature upgrades have also been made to increase performance, as well as flexibility. Examples include a USB 1.1 host, in addition to a USB 2.0 high speed device, dual MMC ports, HSSPI ports as well as other upgraded memory interfaces.